They may not be college students, but the CEOs of these two car sharing companies seem to understand this younger generation's needs. Photo via ZIPCAR, INC.
Zipcar explains that Wheelz designed its car sharing platform specifically to meet the needs of campuses by connecting students who own cars with students who need them. “The model empowers car owners to earn money from their car when they are not using it, while providing convenient and affordable access for car borrowers to conveniently get the vehicle they need for any occasion including errands, shopping excursions, dates and weekend trips,” the company adds. Owning a car is not financially viable for many college students; public transit is not always comprehensive or accessible; and you can only bike so far until your legs give out. P2P car sharing services like Wheelz provide a near-perfect solution in these unique circumstances. Furthermore, each Wheelz car takes 15 cars off the road—adding pollution and congestion reduction to the list of benefits. We already know that car sharing reduces driving, but expanding these services to a new generation and easing their mobility woes is an added benefit. 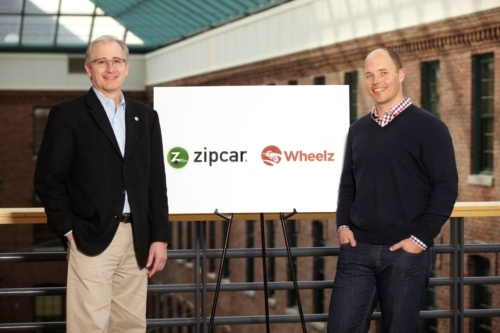 Opening up services like Wheelz to new age groups expands the market for car sharing. In most cases—including Zipcar—users must be at least 21 years old, unless the user is affiliated with certain Zipcar partner universities, in which case 18-year-olds also pass. But this minimum age requirement is not unlike the requirements of other car rental companies. By expanding P2P, companies are opening up to a new market with new opportunities. They are also ingraining the habit of car sharing into younger minds, solidifying the place of car sharing as a legitimate and official mode of transportation, hopefully eliminating more cars from the road. Last month, we wrote about a similar service in Europe called CarPooling, in which users offer available seats and passengers book a ride through the company’s website and mobile phone app. We have also written about the Buzzcar P2P car sharing in France, another business venture of Robin Chase, the co-founder and former CEO of Zipcar.